The Carolina Panthers were among the biggest surprises of the 2015 NFL season. Not only did they finish the regular season with a 15-1 mark, they made it all the way to Super Bowl 50 (before eventually falling victim to the Denver Broncos and their historically dominant defense). Suffice to say, we did not see that one coming. It’s not that we didn’t believe the Panthers had a good football team (clearly, they did), it’s that we can’t help but continue to look at them as the new kids on the block — the organization has only been around since 1995. We’re not trying to sound like football snobs. And yet, when we really think about it, this team actually has a pretty nice history, especially concerning talented players. For the record, while we firmly believe players like Cam Newton and Luke Kuechly will one day find themselves planted firmly at the top of this list, we’ve decided to remove all current players from the equation. This is a history lesson after all. With that in mind, here’s a look at the seven best Carolina Panthers of all time. 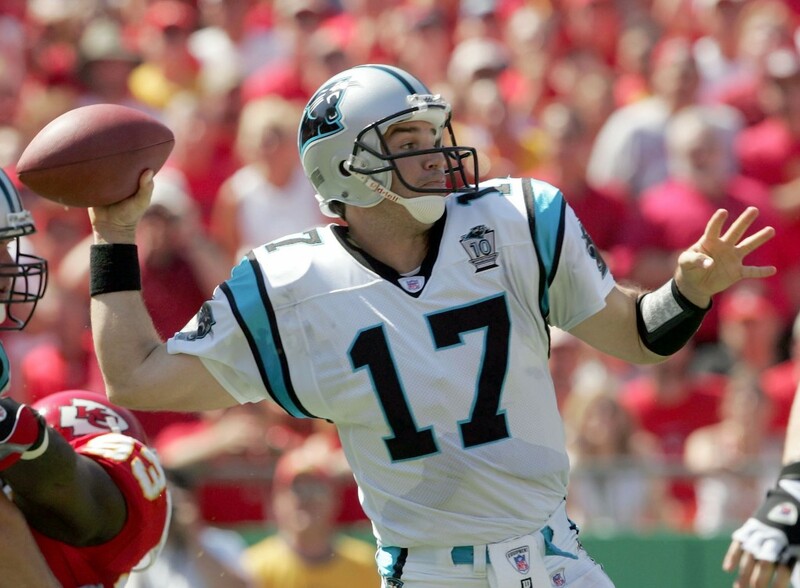 Jake Delhomme may have been known to throw his fair share of interceptions but, aside from being the franchise’s all-time passing leader, he still remains the only quarterback to ever lead the Carolina Panthers to the Super Bowl. Granted, that team ended up losing the game to the New England Patriots, but we choose to focus on the positives (like his impressive performance in Super Bowl XXXVIII). Here at the Cheat Sheet, we don’t discriminate against kickers. And John Kasay was one of the greats. During his 15 seasons with the Carolina Panthers (he was on the inaugural 1995 team), Kasay made 351 field goals, had a field goal percentage of 82.8%, and became the leading scorer in franchise history with 1,482 points. His spot on this list is well-deserved. Running back DeAngelo Williams was a member of the Carolina Panthers from 2006–14. During his nine years with the franchise, Williams ran for 46 touchdowns, earned a Pro Bowl nod in 2009, and became the organization’s all-time leading rusher with 6,846 yards on the ground. Considering what he did with the Pittsburgh Steelers in 2015, we bet the Panthers’ faithful wouldn’t mind still having him around. 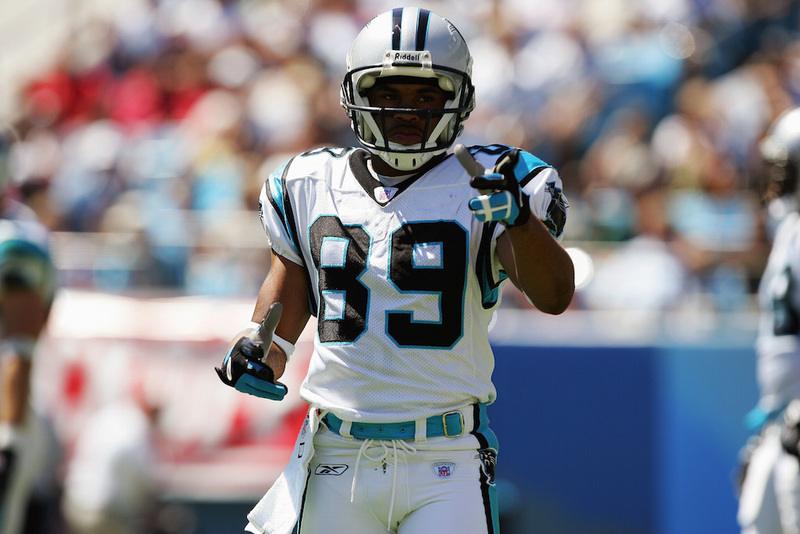 Muhsin Muhammad played with the Carolina Panthers for 11 seasons. During that span, the wide receiver was named to the Pro Bowl twice, earned First-Team All-Pro honors in 2004, and racked up 9,255 receiving yards (the second highest in franchise history). If you want to know just how good Muhammad was when he played in Carolina, we suggest you look at tape from his 2004 campaign. It’s safe to say he was fairly unstoppable. From the moment the Carolina Panthers selected Julius Peppers with the No. 2 pick in 2002, he established himself as one of the most disruptive forces in the NFL. During his time with the Panthers (2002–09), the defensive end was selected to five Pro Bowls (eight total for his career) and became a two-time First-Team All-Pro (three total for his career). 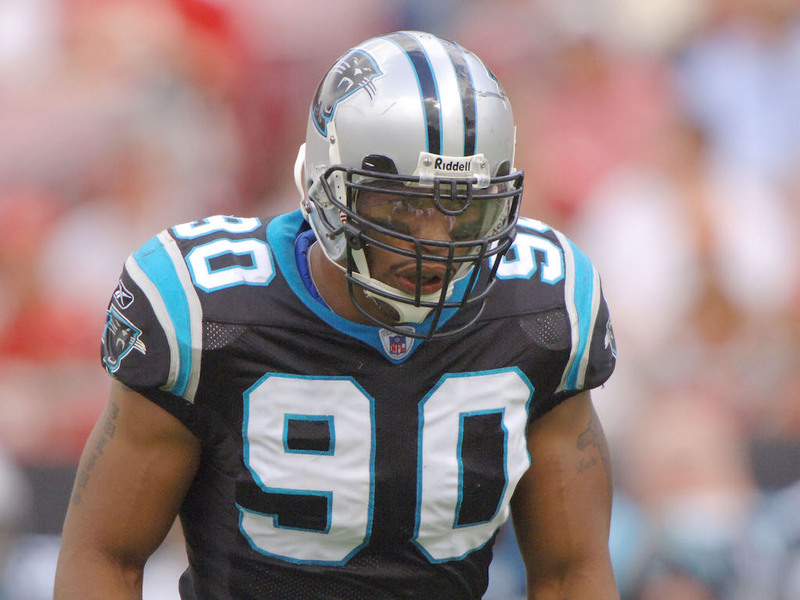 To this day, Peppers remains the all-time sacks leader in Panthers history with 81. 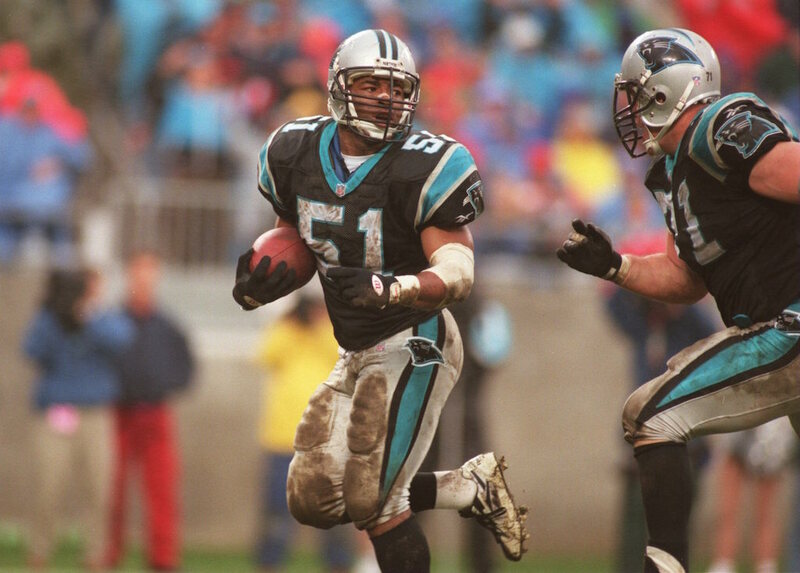 When it came to linebacker Sam Mills, it was less about the talent and more about the heart. You can’t think of No. 51 without immediately recalling his famous motto, “Keep Pounding.” To this day, Mills is the only player in Carolina Panthers history to have his number retired. It’s hard to think of a greater Carolina Panther than Steve Smith. 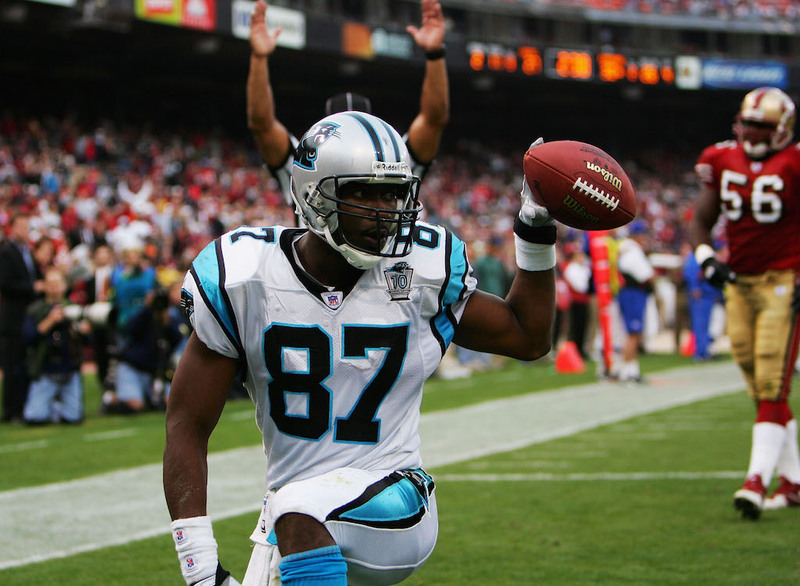 During his 13 seasons with the Panthers, the explosive 5-foot-9 receiver made five Pro Bowls and was named First-Team All-Pro on two separate occasions. He torched defenses for 836 receptions and 67 receiving touchdowns, and became Carolina’s all-time leader in receiving yards with 12,197. What he lacked in size, he more than made up for in game-breaking plays, amazing sound bites, and fierce passion for the sport of football. Until further notice, in our opinion, No. 89 is the best player in Carolina Panthers history. All statistics courtesy of Pro-Football-Reference.com and ESPN.go.com.